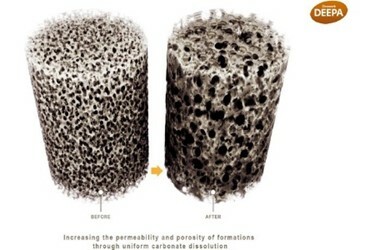 Cleansorb, a leading provider of chemical well treatments that enhance hydrocarbon production for the international oil and gas industry, recently announced that it dramatically increased oil production by up to 250% from mature vertical wells in Canada by treating them with a DEEPA formulation that increases the matrix permeability of the rock and simultaneously remediates nearby wellbore damage. DEEPA, which delivers organic acid deep into the rock matrix via in-situ acid generation, increases permeability uniformly around the wellbore. To treat the Swan Hills Formation wells Cleansorb, and its local partner, formulated a custom DEEPA treatment suitable for a bottom hole static temperature of 90–110°C (194–230°F), which was then administered. Following a brief 24-hour shut-in period to allow the treatment to dissolve the scale and penetrate the rock, production in each well rose by 200–250%, and remained at that level. Since the initial wells were treated in the carbonate Swan Hills Formation, similar results were achieved when applied to mature wells located in sandstone formations containing 5–10% carbonate. Over time, approximately 30 mature wells in Canada have been successfully treated with DEEPA. Cleansorb is an innovative reservoir chemistry company that develops novel wellbore treatments to help its customers operating in the international oil and gas industry to maximize production. The company is known throughout the world for its pioneering range of in-situ acidizing treatments for downhole reservoir stimulation and drilling damage removal applications. Initially, Cleansorb developed DEEPA in-situ acidizing for deep matrix acidizing treatments and to stimulate production from natural fractures in carbonate formations. This was followed by ORCA for WBM, to remove drilling damage from water-based drill-in fluids in openhole wells, particularly in long horizontal wells, and ORCA for OBM to remove drilling damage from oil-based drill-in fluids in open hole wells. Founded in 1994, Cleansorb supports customers around the world from its global headquarters in Guildford, England. For more information, visit www.cleansorb.com.